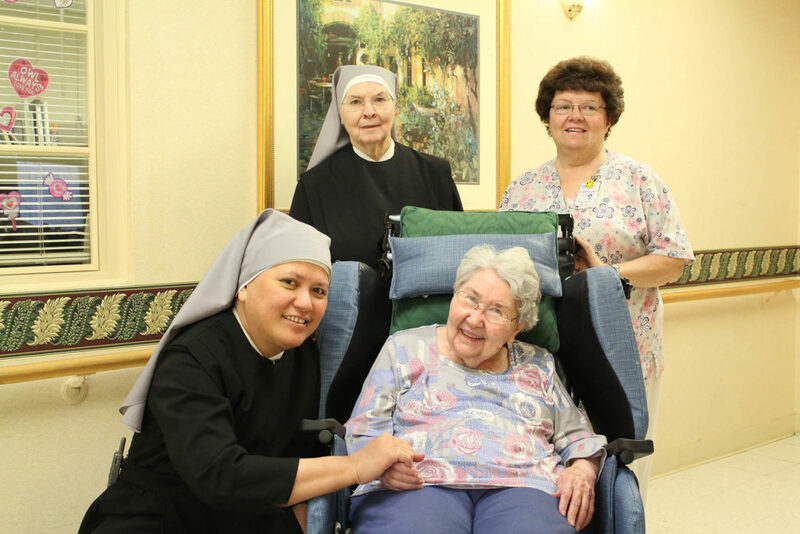 The Little Sisters of the Poor received a $7,000 grant from the Northeastern Pennsylvania Health Care Foundation to support its Ambulatory Preservation Program. The funding was used to purchase three Broda chairs for the nursing units and a shampoo chair and bowl package for the on-site hair salon. The Broda chairs provide stability and comfort for residents suffering from Alzheimer’s disease and others forms of dementia as well as those at risk for falls. The Broda chairs also alleviate pressure on the skin decreasing the likelihood of sores and tears. The shampoo chair and bowl package enables residents with orthopedic conditions to tilt back with greater ease to have their hair washed and then styled. Seated: Mother Theresa Louisa, l.s.p. and Resident Betty Renda; Standing: Sister Marie Therese, l.s.p. and Carolyn Conniff, R.N.